This Chandra image of the Tycho supernova remnant contains new evidence for what triggered the original supernova explosion. Tycho was formed by a Type Ia supernova, a category of stellar explosion used in measuring astronomical distances because of their reliable brightness. 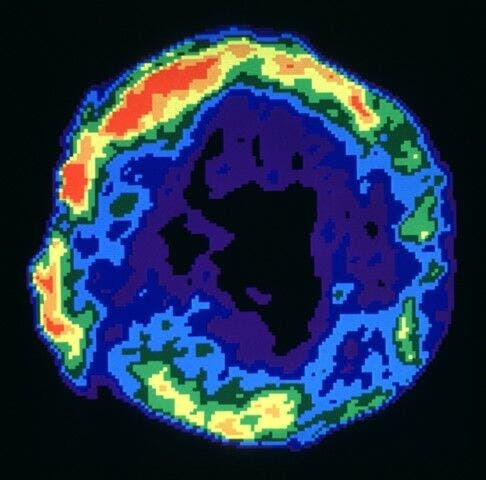 In the lower left region of Tycho is a blue arc of X-ray emission. Several lines of evidence support the conclusion that this arc is due to a shock wave created when a white dwarf exploded and blew material off the surface of a nearby companion star. This supports one popular scenario for the trigger of a Type Ia supernova. Understanding the origin of Type Ia supernovas is important because they have been used to determine that the Universe is expanding at an accelerating rate. Astronomers may now know the cause of an historic supernova explosion that is an important type of object for investigating dark energy in the universe. The discovery, made using NASA's Chandra X-ray Observatory, also provides strong evidence that a star can survive the explosive impact generated when a companion star goes supernova. The new study examined the remnant of a supernova observed by the Danish astronomer Tycho Brahe in 1572. The object, dubbed Tycho for short, was formed by a Type Ia supernova, a category of stellar explosion useful in measuring astronomical distances because of their reliable brightness. Type Ia supernovas have been used to determine that the Universe is expanding at an accelerating rate, an effect attributed to the prevalence of an invisible, repulsive force throughout space called dark energy. A team of researchers analyzed a deep Chandra observation of Tycho and found an arc of X-ray emission in the supernova remnant. Evidence supports the conclusion that a shock wave created the arc when a white dwarf exploded and blew material off the surface of a nearby companion star. "There has been a long-standing question about what causes Type Ia supernovas," said Fangjun Lu of the Institute of High Energy Physics, Chinese Academy of Sciences in Beijing. "Because they are used as steady beacons of light across vast distances, it is critical to understand what triggers them." One popular scenario for Type Ia supernovas involves the merger of two white dwarfs. In this case, no companion star or evidence for material blasted off a companion should exist. In the other main competing theory, a white dwarf pulls material from a "normal," or sun-like, companion star until a thermonuclear explosion occurs. Both scenarios may actually occur under different conditions, but the latest Chandra result from Tycho supports the latter one. 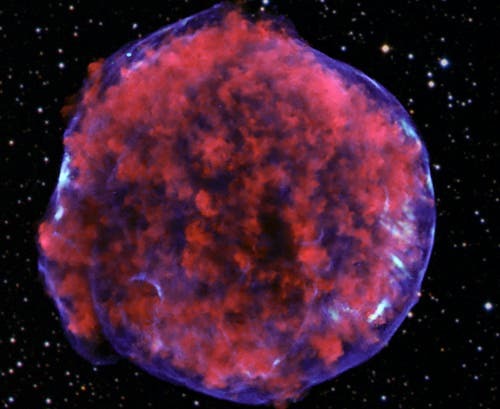 In addition, the Tycho study seems to show the remarkable resiliency of stars, as the supernova explosion appears to have blasted very little material off the companion star. Previously, studies with optical telescopes have revealed a star within the remnant that is moving much more quickly than its neighbors, hinting that it could be the missing companion. "It looks like this companion star was right next to an extremely powerful explosion and it survived relatively unscathed," said Q. Daniel Wang of the University of Massachusetts in Amherst. "Presumably it was also given a kick when the explosion occurred. Together with the orbital velocity, this kick makes the companion now travel rapidly across space." Using the properties of the X-ray arc and the candidate stellar companion, the team determined the orbital period and separation between the two stars in the binary system before the explosion. The period was estimated to be about 5 days, and the separation was only about a millionth of a light year, or less than a tenth the distance between the Sun and the Earth. In comparison, the remnant itself is about 20 light years across. Other details of the arc support the idea that it was blasted away from the companion star. For example, the X-ray emission of the remnant shows an apparent "shadow" next to the arc, consistent with the blocking of debris from the explosion by the expanding cone of material stripped from the companion. "This stripped stellar material was the missing piece of the puzzle for arguing that Tycho's supernova was triggered in a binary with a normal stellar companion," said Lu. "We now seem to have found this piece."